It is no gain say that the Nigerian police boast some of the most wonderful, the most courageous, the most professional officers and men that can rival any from around the world. And no one can deny the reverse too that there are more than enough bad eggs in its basket too. It's only normal you might say after all out of every twelve there is always a Judas. In spite of this natural mix, it has always managed to achieve resounding successes at the international stage thereby putting the country on the global focus for the right reasons. The potential is always there, one may argue! But if the force could harness it overseas why not here. After all charity, they say, begins at home. I mean why take the trouble to give your best when on international duty say the UN peace keeping mission and cannot replicate same on the home front. Bearing firearms, history and experience have shown us that they are equally some of the most dangerous if not the most dangerous in the world. They are more of a threat to innocent citizens than to men of the underworld whose crime rings they were primarily recruited, trained and deployed to bust before they unleashed their dastardly acts. And I say this with a deep sense of concern and responsibility. On duty particularly he shows some degree of touchiness, overbearing and at most easily predisposed to wreck undue havocs at the slightest provocation. From Sokoto to Bayelsa; from Lagos to Borno tales of their infamous exploits abounds that one may not be able to exhaustively deal with from now till eternity. Stories abound of policemen who had resorted to pointing gun at bus and cab drivers on the account of their refusal or reluctance to part with miserable amounts. Overtime, countless number of drivers, innocent passers-by, commuters and people travelling with substantial amount of money on them has been downed by bullets from many of these wilful, criminal minded and trigger happy police personnel for some of the most trifling reasons one can think of. Men of the Nigerian police force have had cause to kill and will kill over dispute centred on money that is as low as fifty naira or less. And whom it involves does not matter. Now imagine if money that run into several thousand or more is involved. He automatically transformed into a heartless killing beast. As such there is the need as always for the citizenry to be wary when interacting with an arm bearing ones. So I'll advise that you shouldn't joke with a Nigerian policeman that's armed especially in case you have cash and other valuables on you. Even in a normal stop and search situations still be wary. It can't be too much. He might be having perwonal or mental issues. He might also be having issues with his colleagues or his boss which can predisposes him to committing an act of transfer aggression. And with a gun in his hands, he is more deadly. He might even be high on alcohol, marijuana and other substances for it is not out place to see police personnel hanging around spots where these items are freely sold. It is not even out of place to see them requesting for alcoholic gratifications from familiar everyday guys who eagerly oblige them because of their professional badges. For these reasons he is more likely to misbehave than not so don't take chances on your expectations that he should always be on his best human behaviours and professional conduct. 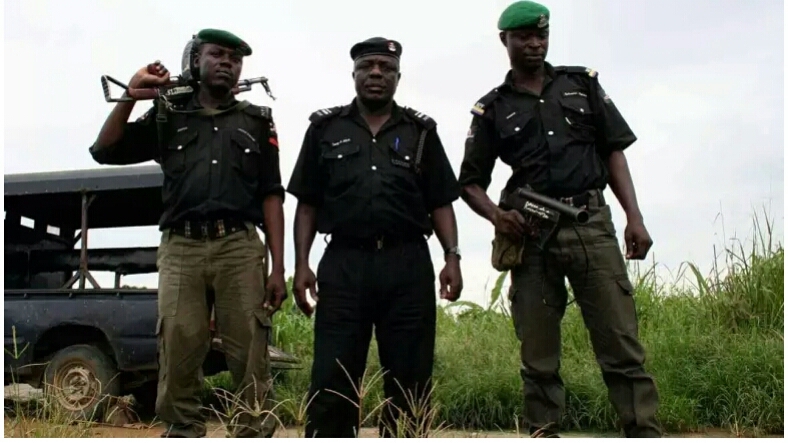 Perhaps you missed a related story that breaks earlier this week of a police inspector who killed his boss, a DPO, over guess what, one hundred and fifty thousand naira in the south west part of Nigeria. This of course is the latest addition to the overflowing basket of its professional malaise. According to the story the inspector had been summoned by the DPO who have it on good authority that the inspector had collected the sum of one hundred and fifty thousand naira on a case he was handling. And he was said to have been ordered by the inspector to return the money. Obviously, this got him infuriated. Heated argument between the two was said to have ensued. The inspector was said to have stormed off the DPO's office only to return with his service rifle and gun down his superior. But he immediately realizes the enormity of what he has just done. So he jumped into the well right within the premises of the station and he died in the process. If a policeman can have the audacity to kill his boss over money; tell me who such a man cannot kill. And they have killed many before and they will still kill if money is involved. So I repeat the fear of an arm bearing police man is surely the beginning of wisdom. Be wise I'll insist when dealing with men of the force. Never underrate him when he threatens because he might be getting funny feelings from other sources beyond his control. While there is no denying that there are many policemen with impeccable professional track record in the service; the fact still remain that there are many others too with questionable even roguish antecedents. In fact many of them are hardened criminal, depressed, drug addict, alcoholic and are on the edge at all times to commit one act of atrocity or the other. And until the force finds a way to flush out these bad eggs from the service; improve on its recruiting and training methodologies; perhaps improve on the welfare of officers and men of the force, I'm afraid instances like these may be a recurring decimal in our national existence for a long time to come. As a consequence, finally, it will worsen the degree of distrust that alreasy exist between it and members of the public whom it has consistently been wooing for support in the discharge of the onerous task of national security providing.